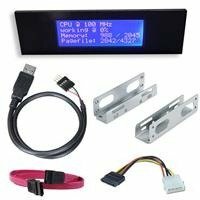 ServersPlus has their LCD screen mod we mentioned earlier this month available as an upgrade kit for the HP ProLiant MicroServer. The kit includes a LCD screen, Internal USB Header to USB converter cable, and a bracket (including cables) to mount a 3.5" hard-drive in the optical bay behind the screen. The USB LCD panel displays 4 lines of 20 characters, which can display a wide range of information on your MicroServer. The kit is available for £29.95 (ex VAT) and more information including the installation instructions can be found here.